Delicate and nourishing for sensitive skin – Having sensitive skin doesn’t mean that you should miss out on pampering yourself. Whether you’ve always had complex skin, or simply have chemical sensitivities, DermaQuest’s Sensitized Collection has been specifically formulated to nourish and purify even the most sensitive of skin. With the choice of a gentle cleansing cream, a silky moisturiser and a soothing serum, your delicate and irritable skin can be nourished and refreshed without stripping out natural essential oils. 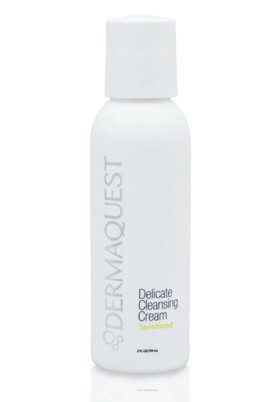 DermaQuest’s smooth and gentle cleanser purifies your delicate skin without removing essential oils or dehydrating it. With a silky and refreshing, texture we use restoring ingredients that will leave your skin feeling plump, smooth and refreshingly clean. DermaQuest’s luxurious blend of Argan, Jojoba and Olive Oil creates a moisturising barrier that soothes your sensitive skin without causing inflammation or irritation. This calming and softening moisturiser gently pampers and rejuvenates distressed skin. 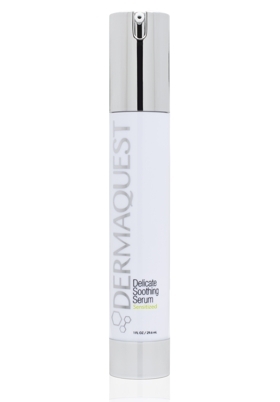 DermaQuest’s Delicate Soothing Serum is a replenishing formula that has been designed to calm sensitive skin and is ideal for use after treatment. It contains plant stem cells that are soothing and nourishing along with extracts of Green Tea which help to regenerate skin cells. The Delicate Soothing Serum also reduces redness of the skin that is often associated with acne, rosacea and ablative treatments. Copyright 2015 In You Beauty | Website by LGX Marketing, Training & Events All Rights Reserved.